Three more children, two school staffers being laid to rest one week after the Sandy Hook Elementary shooting. 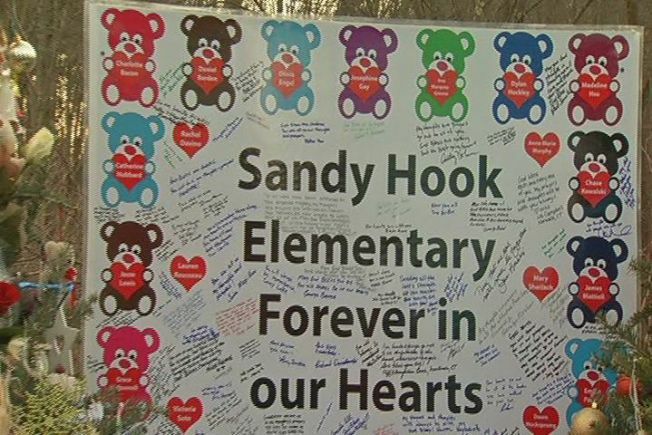 Church bells across the country rang 26 times Friday morning—one for each of the victims killed at Sandy Hook Elementary School —to mark the one-week anniversary of the Connecticut shootings. Gov. Dannel P. Malloy observed a moment of silence with other offiicials on the steps of Newtown's town hall where a bell chimed for each victim and names were read. Five more shooting victims, including three children, were to be buried later in the day. Thousands of congregations affiliated with the National Council of Churches participated in a minute of silence as their bells rang out. A group of interfaith leaders meeting in Washington to discuss gun control and mental health reforms paused as well, as the National Cathedral's funeral bell tolled. Governors from Louisiana to Hawaii to Illinois joined Malloy’s call for a moment to remember the 20 schoolchildren and six faculty members killed in one of the deadliest school shootings in U.S. history. The federal government participated as well, with President Obama privately observing the solemn 9:30 a.m. occasion at the White House. In the immediate aftermath of the Newtown tragedy, Obama vowed "meaningful action" and announced Vice President Joe Biden would lead a group to come up with "concrete proposals" to reduce gun violence by the end of January. Obama said in a web video Friday he was encouraged by a “We the People” petition posted on the White House website calling for more gun control. "We hear you," he told signers of the petition, which has amassed 200,000 supporters. The National Rifle Association, which had been largely silent since the tragedy, held its first press conference Friday. The group called for an armed police officer to be stationed at every school in the country and also blamed video games, movies and media companies for a contributing to a culture of violence. Students in Prince George's County paused today for a moment of silence in memory of the victims of the Sandy Hook tragedy. News4 Prince George's County Bureau Chief Tracee Wilkins reports. "The only thing that stops a bad guy with a gun is a good guy with a gun," said NRA Executive Vice President Wayne LaPierre. Secretary of Education Arne Duncan, meanwhile, marked Friday's moment of silence at an elementary school in Washington D.C., where he was scheduled to speak at a school safety forum. His visit to Neval Thomas Elementary School was his first public appearance since the shooting last week. A group from the technology world planned an Internet-based moment of silence. By Thursday evening, more than 150,000 people had signed a pledge to participate in a “five minute pause from all online activity” organized by Nick Grossman, an activist at Union Square Ventures, and the team at the activist site, Causes.com. Huffington Post, ESPN, Foursquare, TechCrunch, AOL, Gilt and Adobe were among the sites that participated in the online moment of silence, according to Ad Week. Stockbridge First United Methodist Church in Georgia rang its bells 27 times to include Nancy Lanza, the mother of gunman Adam Lanza who fatally shot her before ambushing Sandy Hook Elementary School and taking his own life. “I think for us, she’s a victim, too,” said Rev. Jody Ray, NBC News reported. “We probably should have included the young man who committed the crime." Back in Newtown, funerals continued for a fifth consecutive day. Three more children and two school staffers were being buried. They include: 6-year-old Olivia Engel; 6-year-old Dylan Hockley; 7-year-old Grace McDonnell; behavioral therapist Rachel D'Avino, 29; and school psychologist Mary Sherlach, 56. As the sad routines continued in Newtown, First Lady Michelle Obama offered recommendations to parents wondering how to discuss the tragedy with their children. "We can tell our kids that we're doing everything we can to keep them safe and make sure they fee loved—and so are their teachers, coaches, faith leaders, Scout leaders and everyone else who plays a role in their lives. "We can tell them that it's our job now to stand with the people of Newtown—to pray for them and to find ways, large and small, to show them that they are not alone in their grief. It is now up to us to carry the memory of those who were lost in our hearts and to follow their example every day, living our lives as they lived theirs—with courage, determination, hope and love. "Those are the values that give us our strength as Americans and that we return to in times of crisis—not just because they help us heal, but because they define who we are, as a people and as a nation."